Abundance : Frequently on the fore reef zone, seldom on te reef flat zone. Variable in colour and easely recognized by the shear zones on the mantle. The body is divided dorsally into four (fused) parts, three of which readily autotomize. The main central section is surrounded by three crescent-shaped lobes, two lateral ones which meet anteriorly at the midline, and a posterior one. We can observed three color form in our area : A yellow-brown reticulated form, a yellow-brown dotted form and a white form. This species is extremely variable in color and ranges from white, yellow, brown or black, with or without mottlings of a different color. There is a brown line edging the foot and one extending from the oral veil edges posteriorly between the mantle and the foot. The gill is located on the right side, orange with dark brown to black rachides on the pinnae. It is characterised by its ability to autotomise (break off) large sections of its mantle when disturbed. 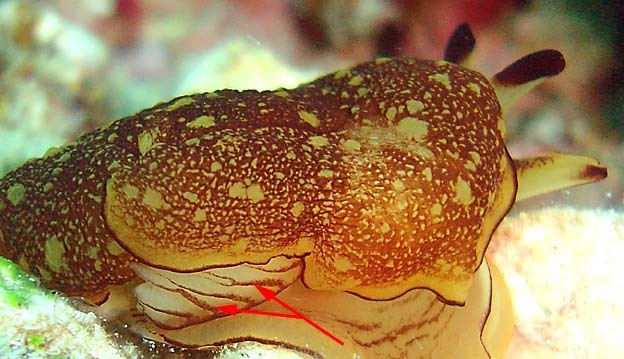 The brown central ring and the lines visible in paler animals marks the breakage point when the animals breaks off its mantle skirt. The metapodium bears a brown patch on the end in the larger specimen and a median line on the smaller animal. The mantle can produce a white fluid when the animal is disturbed. The animals found in shallow water were associated, for the most part, with a mixed live/dead stony coral reef environment; those animals collected from deeper waters usually on vertical, invertebrate-covered walls at the reef drop off. 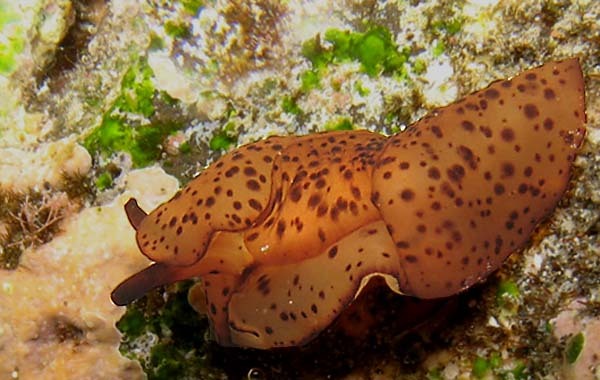 According to bill Rudman, this species feeds on sponges (as other species of Berthella). 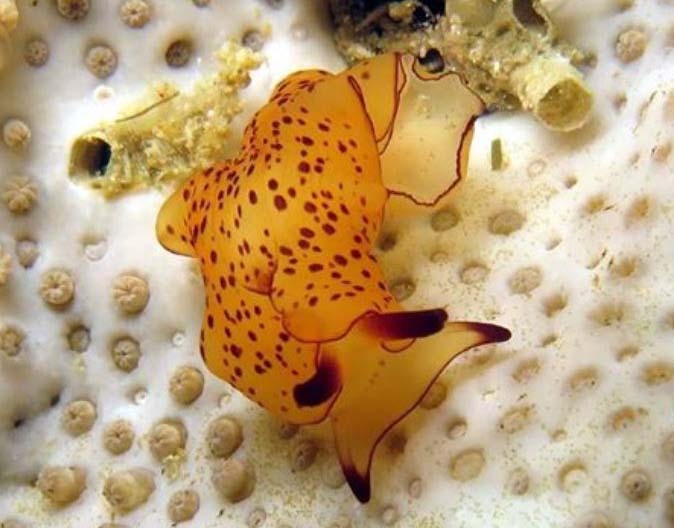 And according to Gosliner this species feeds upon tunicates. According to Willan (1984) it lays a flaccid white spawn coil. Ova measuring 75-95 µm occur singly in capsules (up to 190 µm diameter) that are loosely coiled in cylinders within the spawn. Approximately 315 ova make up a single spawn. 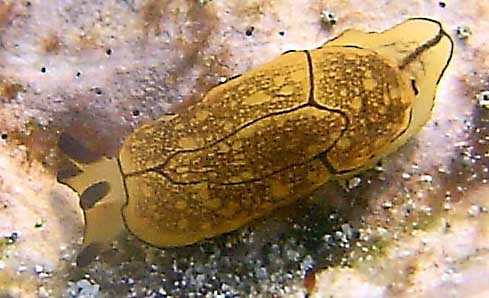 Thin, convex, "papyracée" and yellowish shell. 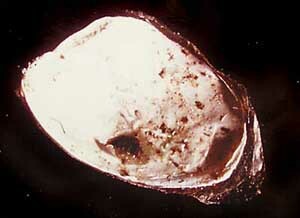 The internal face is cover by a thin calcareous layer. - A yellow-brown form (upper photo), the preponderant form in our island. 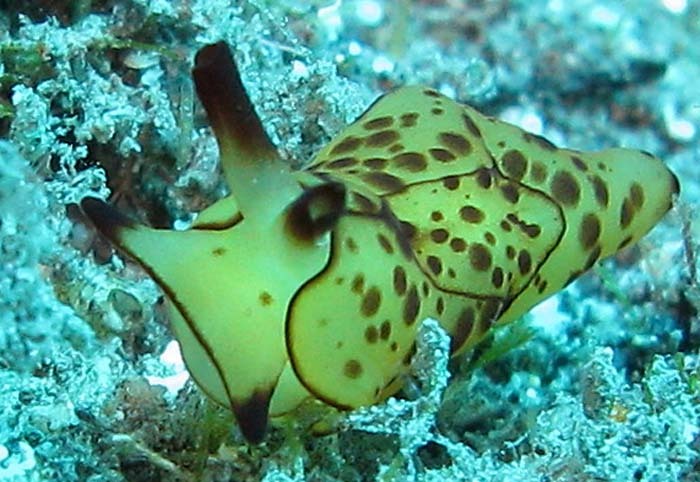 Marina Poddubetskaia observed the same color form in Mauritius. - A white form (see below, Emmanuel Eby's specimen), sometimes spcekled with black to dark brown spots. Ortea J., Moro L. & Caballer M. (2014). 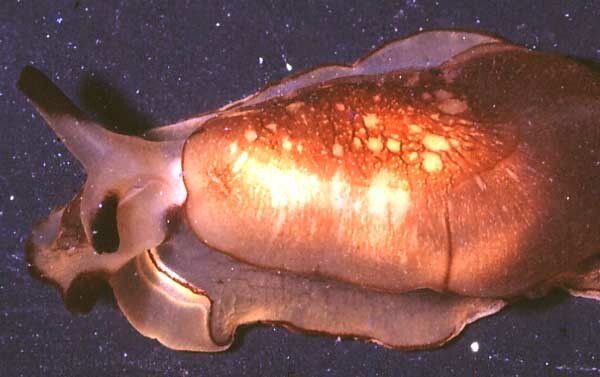 Contribución al estudio de la familia Pleurobranchidae Gray, 1827 (Mollusca: Opisthobranchia) en la Macaronesia y las islas Galápagos. Vieraea. 42: 117-148. Willan, R.C. (1984) The Pleurobranchidae (Opisthobranchia: Notaspidea) of the Marshall Islands, Central-West Pacific Ocean. The Veliger, 27(1) : 37-53. Yonow, N. (1994) Opisthobranchs from the Maldive Islands, including descriptions of seven new species (Mollusca: Gastropoda). Revue fr. Aquariol., 20(4) : 97-130. The gill (a) is located on the right side, orange with dark brown to black rachides on the pinnae. Reunion, "Les antennes" at Saint leu, 12m, size : 20-25 mm, 04 May 2005. A white form. 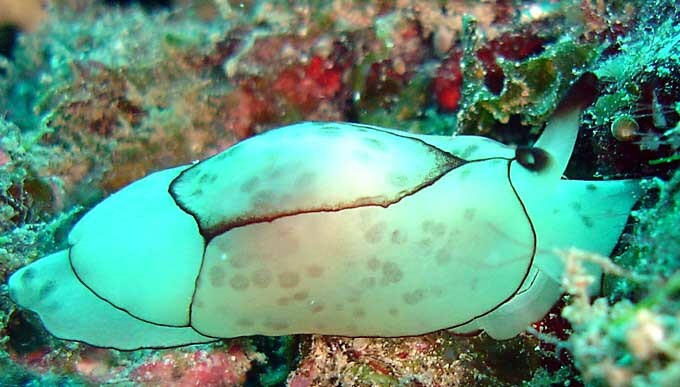 We clearly see in this photo the internal face of the cylindrical rhinophore. The gill is orange with dark brown to black rachides on the pinnae. The body is divided dorsally into four (fused) parts, three of which readily autotomize. The main central section is surrounded by three crescent-shaped lobes, two lateral ones which meet anteriorly at the midline, and a posterior one.